The intricacies and richness of the natural emerald world would not be complete without a glossary to help further explain important terms and concepts. Marie Antoinette painted wearing an intricate aigrette in her hair. Aigrette: a piece of jewelry that either contains feathers or resembles a plume of feathers, usually worn in the hair or on a hat or turban. Anisotropic: a term describing gem materials that exhibit different optical properties in different crystal directions. Apotrope: an amulet or talisman that protects the owner by warding off evil. Asterism: a term that refers to the stars that can be seen in some cabochon-cut beryls. Birefringence: the maximum numerical difference between the two refractive indices of an anisotropic material such as emerald. Stress induced birefringence in plastic. Blemish: a gem characteristic or irregularity that is confined to the surface of the stone. Brilliance: describes the amount of light reflected back to the viewer from the interior of a cut stone. 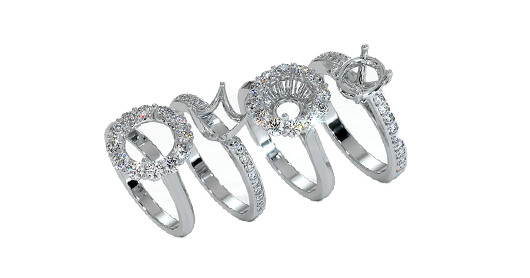 Brilliant cut: a popular cutting style with triangular or kite-shaped facets. Briolette: a teardrop-shaped gem with triangular facets and no girdle. A cabochon emerald ring in an Edwardian style. Cabochon: a smoothly rounded and polished stone with a domed crown and a flat or curved base. Calibrated sizes: gemstones cut to certain sizes to fit standard mounts. Chatoyancy: an optical effect referred to as a “cat’s eye” which is seen in some gemstones. It is caused by fibrous inclusions or needle-like structures found within a gem. Cleavage: breaks or cracks in a gemstone parallel to lines of atomic weakness within the crystal framework. Color zoning: portions of a stone that exhibit different colors due to variable growth conditions experienced during crystal formation. 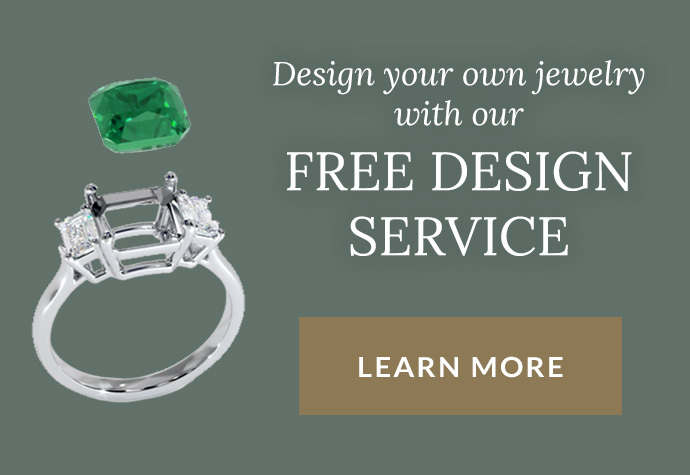 Commercial quality: average quality, mass-marketed gemstones, as opposed to high-end gemstones. Conchoidal: describes fractures that have a shell-like surface, often with concentric ridges. Conchoidal fractures are commonly seen in glass. A drawing depicting French women creating a corbeille. Corbeille: a 19th century tradition where the groom presents the bride with a marriage gift—often a casket of jewels. Crown: the top of the gem above the girdle. Culet: the tiny facet or point at the very bottom of a cut gemstone. Designer cuts: unique and artistic stone cuts that do not have traditional or specific facets, shapes, or styles. Dichroic: a term that describes gems that exhibit only two pleochroic colors. Dispersion: the breakup of white light into spectral colors. Diamonds have high dispersion; emeralds have low dispersion. An instance of double refraction in a crystal. Double refraction: an optical doubling effect that is caused by the splitting of light into two separate components in an optically anisotropic material such as emerald. Durability: a gem’s natural ability to withstand heat, chemicals, and wear. Enamel work: the fusion of colored glass onto metal. Different kinds of enameling include basse-taille, champlevé, cloisonné, plique-à- jour, and sgrafitto. Extinction: areas of a transparent gemstone where the body color looks very dark to black. This can be caused by improper cutting. 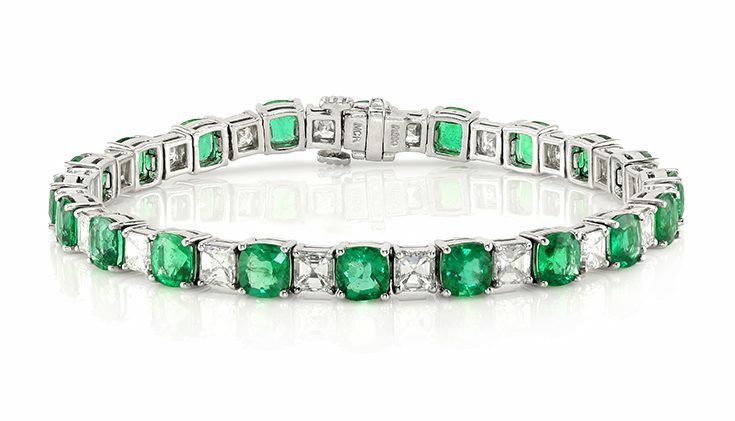 Very few emeralds will ever appear as eye-clean. Eye-clean: gemstones with inclusions that are only visible with the aid of magnification. Facet: a flat polished surface on a cut gemstone. Festoon necklace: an elaborate necklace made with multiple chains of garlands, swags, and other ornamental drops that typically drapes from shoulder to shoulder. Finishing: adding the polish and symmetry to a fashioned gemstone. This term also refers to the process of cleaning and polishing an item of jewelry— where tool marks are removed, edges are smoothed, luster is achieved, or other surface effects are applied. Flux growth: a process for creating synthetic emeralds in which the crystals are grown in a liquid flux solution. This emerald has a deep fracture at the top center of the stone. Fracture: breaks or cracks in a stone that are not along cleavage planes. Fracture filling: a process in which the fractures in a gem are concealed by a variety of fillers thus improving the apparent clarity. Girdle: the junction between the crown and pavilion of a stone, often corresponding to the area of a gemstone with the largest dimension. Habit: the characteristic shape or form of a mineral crystal. Hardener: a chemical that emerald treaters mix with some resins to cause them to harden. Hardness: a gemstone’s resistance to scratching and abrasion as measured by the Mohs Hardness Scale. 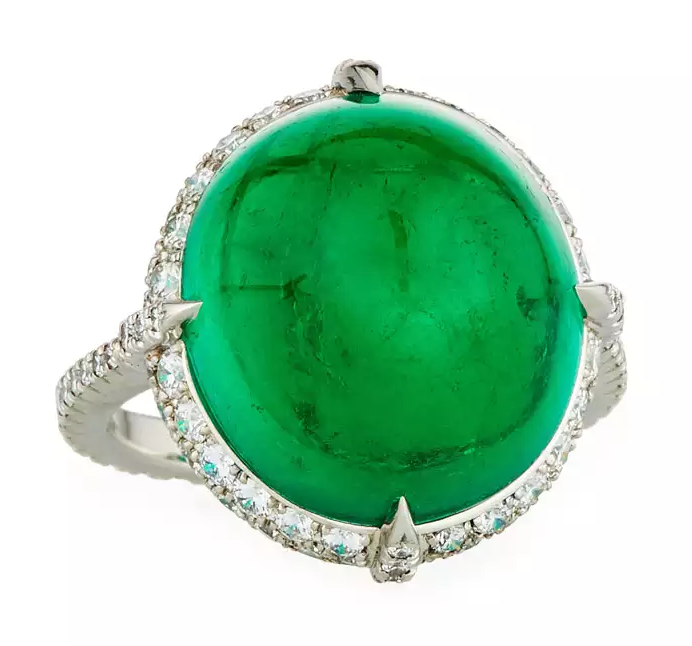 Hue: a gemstone’s basic color, as in green emeralds. 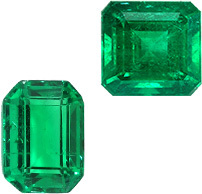 Examples of the range of hues present in emeralds. Hydrothermal process: a means for producing synthetic emerald using acidic water solutions at high temperature and pressure. Igneous rock: rocks formed by the crystallization of molten magma. Inclusion: a feature of a gem such as a feather, a crystal, or a cloud that reaches the surface or is enclosed within the stone. Inclusions can have both positive and negative effects on the value of the gem. A Kundan emerald jewelry set with diamonds and pearls in gold. Kundan: the setting of precious and semi-precious stones within bands of highly purified soft gold. Often kundan work is combined with enameling (meenakari), so that a piece of jewelry has two equally beautiful surfaces, enamel on the back and kundan-set gems in front. Lariat: a very long necklace (usually wrapped around the neck two or more times) with unattached ends that are tied or knotted in different ways on the chest. Lavalier: a necklace with two pendants of unequal length suspended from it—also called a negligee necklace. Lavalier is also used as a generic term to describe necklaces with a drop pendant. Lithification: the process of converting sediments to solid rock usually through cementation and/or compaction. Luster: the surface appearance of a material in reflected light– in emerald, the luster is typically vitreous. Magma: molten rock, including any dissolved gases and crystals, usually found at great depth in the Earth. Melée: very small faceted gemstones that are often used in pavé settings. Metamorphic rock: rock formed by the transformation of pre-existing solid rock deep within the Earth via a process involving heat, pressure, and/or chemically active fluids. Mixed cut: a cutting style that combines brilliant and step cutting styles. Mounting: the precious metal part of an item of jewelry before the stones are placed into it. 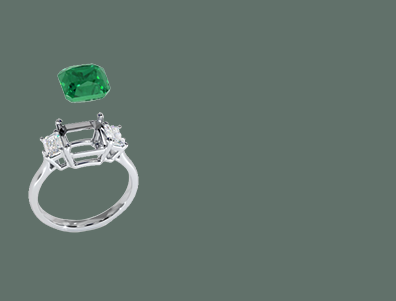 Native cut: an informal gemstone cut that is determined by the natural shape, color, and clarity of a rough emerald crystal. Overburden: the waste rock or soil that lies above the material of economic interest in mining operations. 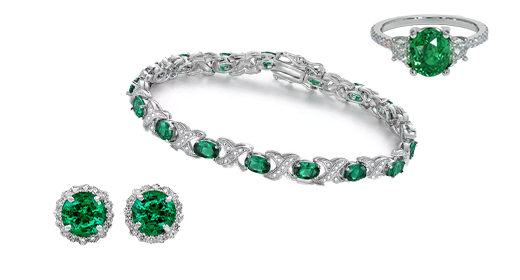 A fantastic emerald and diamond parure. Photo credit: Christie’s. Parure: a matched set of jewelry pieces. A popular style through the 19th century, a complete parure consisted of two matching bracelets, a necklace, earrings, and a brooch. Pavilion: the lower part of a gem below the girdle. Pegmatite: a special type of igneous rock composed mostly of very large crystals of rock-forming minerals and containing a high percentage of rare and unusual elements. Phenomena: an unusual optical effect in a gemstone, including chatoyancy and asterism. Pleochroic: describes a gem that exhibits different body colors when viewed from different crystal directions. Porosity: a metal defect that appears as pits or holes in the surface. Primary deposits: gemstones that are found in situ, or contained within their host rock. Proportion: the overall shape (angles and dimensions) of a fashioned gemstone. Refractive index: a number that indicates the property of light refraction in a material. In gemology, the refractive index is highly diagnostic and gives an indication of the optical density of a gem relative to that of air. A lovely piece of emerald crystal rough. Rough: a natural, uncut gemstone crystal. Saturation: the strength or intensity of a color (hue). Sautoir: long chains or ropes of pearls or beads that have tassels at the ends. Secondary deposits: gems that are deposited away from their primary source. Sedimentary rock: rock formed from weathered products of pre-existing rocks that have been transported, deposited, and lithified. A silver pendant featuring an emerald simulant stone. 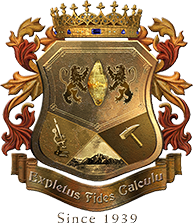 Simulant: natural or artificial materials that imitate the appearance of a gem without possessing any of its chemical or physical properties. Solder: a metal or metal alloy used to join other metals together. Specific gravity: the ratio of the weight of a material to the weight of an equal volume of water. Step cut: a popular cutting style with square and rectangular facets. Synthetic: a man-made gemstone that has the same composition and structure its natural component. Tone: the darkness or lightness of a color (hue). Torsade: a twisted, multi-stranded short necklace or bracelet usually made of beads or pearls. Toughness: a gemstone’s resistance to chipping, cracking, and breaking. A diagram illustrating how a window appears within a gemstone’s cut. Trace elements: atoms in a gem that do not constitute part of its basic chemical composition, but occur as minute impurities. 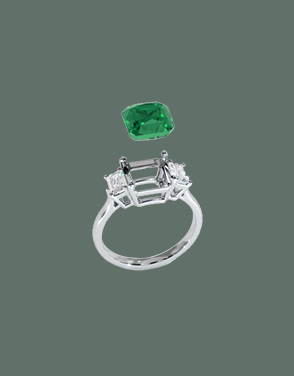 Trace elements determine the color of some gemstones, including emerald. Uniaxial: describes materials, such as emerald, with a single optic axis, or direction parallel to which no double refraction refraction occurs. Windows: portions of a transparent gemstone where the body color appears to be see-through or watery. This can be caused by improper cutting. 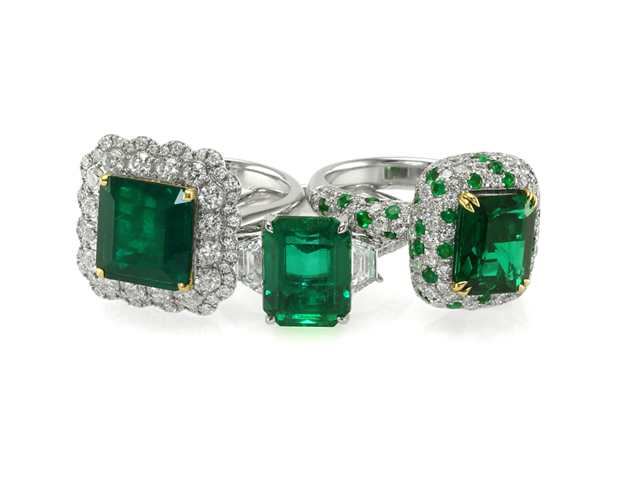 Vitreous: describes the luster of an emerald when the reflections off its surface resemble those of glass.